Since 1992 the Greater Boston Chapter of United Spinal Association (GBC) has been dedicated to improving the quality of life for those with spinal cord injury or disorders (SCI/D). With your donation we can continue our mission to Reach, Inspire, Support and Empower our peers. After having a SCI/D, life seems upside down. The Greater Boston Chapter of United Spinal Association works one on one with you to help improve your quality of life. All of our peer mentors have had years of experience with a spinal cord injury or disorder. There is life after SCI/D. We’re here to support and empower you to reach your goals and return to doing the things you love. Because we want you to thrive in life as we have. Our annual Roll to Win Casino Night and Gala celebrates our mentors and the work that they do. It's a wonderful night of gambling with funny money, auctions and raffles, and a great excuse to get dressed up. 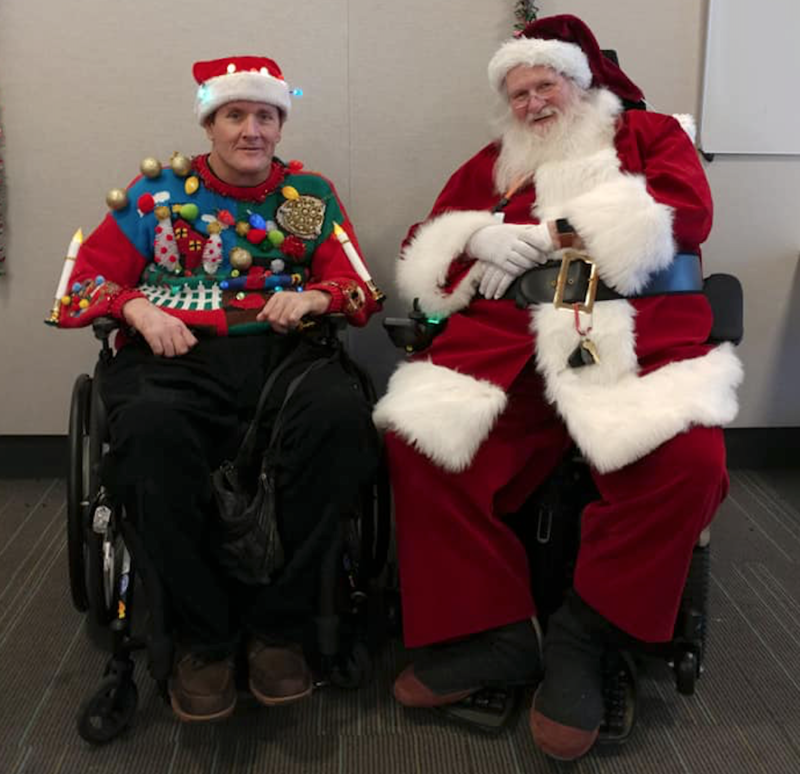 Every year we have a holiday party with our very own Santa! It began with having our organization's mentors getting together and in recent years we have opened it up to our members. Last year was filled with fun, good food, and an ugly holiday sweater contest! (winner seen above with Santa) Check out our Events page for this years Holiday Party. In 2015 we donated a Paragolfer to the Spaulding Adaptive Sports program which will be available at the Ponkapog and Weston Golf Courses as part of the DCR Universal Access Program. Want to hit the links? Click here to learn more! Started in 2016, we have a potluck picnic and hike on an accessible trail at DCR's Harold Parker State Park in Andover. The trail we explore are accessible by wheelchair, but many of or participants use one of the many fun adapted vehicles and chairs that some of our mentors bring along for people to try out.